Dr. Gerry Landis is a respected physicist, confident that he�s current in field. Then two students take him to the modest suburban home of Jeremiah Washington where he sees an amazing generator that powers the house using only water for fuel, a generator that could change the world. When Gerry realizes that everything he knows, all the work he�s done is suddenly obsolete, he burns with the desire to learn how the amazing generator works. 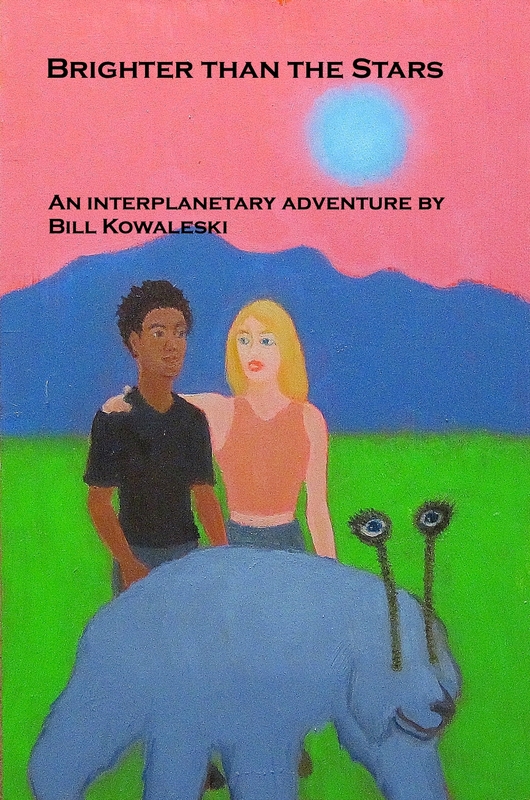 Gerry�s quest leads him to the planet Cygnus Prime where he and the two students, nerdy Keyshawn, and beautiful martial arts master Elka, go to study the science behind the generators. There they run up against an extremist group intent on driving outsiders from their planet. The extremists kidnap Keyshawn and sabotage the generator in Jeremiah�s house, badly injuring him. Gerry, Elka, and their new alien allies now have no choice but to redirect their efforts to saving both Keyshawn and Jeremiah. Brighter than the Stars is an interplanetary adventure full of the wonder of discovery and the danger and mystery of deeply alien cultures. While modern in theme and setting, it captures the positive spirit of Golden Age sci-fi. �I am assigned to work with a new species from an unknown planet.� The Ethnologist nuzzled his eyestalk into her dark brown fur so the calves could not pick up their conversation. �Will it be dangerous?� she asked, sending along uncertainty and small-fear. The tunnel led directly from their home to a field just ten minutes� walk away. As they joined the larger channeling tunnels, they met many members of their herd. The group grew larger, and they were soon in a thick throng. They put their heads down, following the crowd in front of them, reverting to the instinctive behavior that gave them an indescribably deep satisfaction. The tunnel slowly ascended to a bright opening and the herd spread out on the lush grazing commons, theirs since before the First Stories, since the times of the First Fences. The Ethnologist�s mate led him to their clanspace where they saw her closest friend, Grass-Feeder, her rich brown fur glistening in the low sunlight. The calves rushed toward their area, bounding on two legs in anticipation of seeing their friends. Just then a blue-gray-furred male approached. �Welcome, Nature-Protector, mate of Grass-Feeder,� said the Ethnologist. �A most pleasant evening, my friends,� he replied. �Higher goals? And what would those be? Wouldn�t the highest goals of all be to protect our culture, to honor our past, to ensure our safety?� Nature-Protector transmitted strong group solidarity feelings to reinforce his thoughts. The Ethnologist had had enough. He knew his clan disapproved of his contacts with predator species but he loved nothing more than learning about new worlds and new creatures. There was an unbounded universe above them, and all his clan could do was lower their heads and prattle about the past. He wandered out of transmission range, allowing them to continue their unpleasant discussion. Nature-Protector nodded in supportive approval. �My mate works with these creatures. He has never been harmed and finds them interesting. He would lose his work if your crusade were to prevail. So no, I won�t join you.� She made sure that she sent her clan mates the strong-anger and upset that she felt.